Now I’m assuming you have a website because this is the 21st century after all. Its 2016 when I’m recording this. Surely your business has a website. Now don’t tell me you’re getting one, because you should just have one. It’s no big deal. And this is where a lot of people go wrong. You’re overthinking it. Your website has to be a lot more simple then you think. Because it’s job is to create new customers. It is not there just to give you an alternative place to send people to save on having print brochures for them. Don’t just say go and have a look at my website. 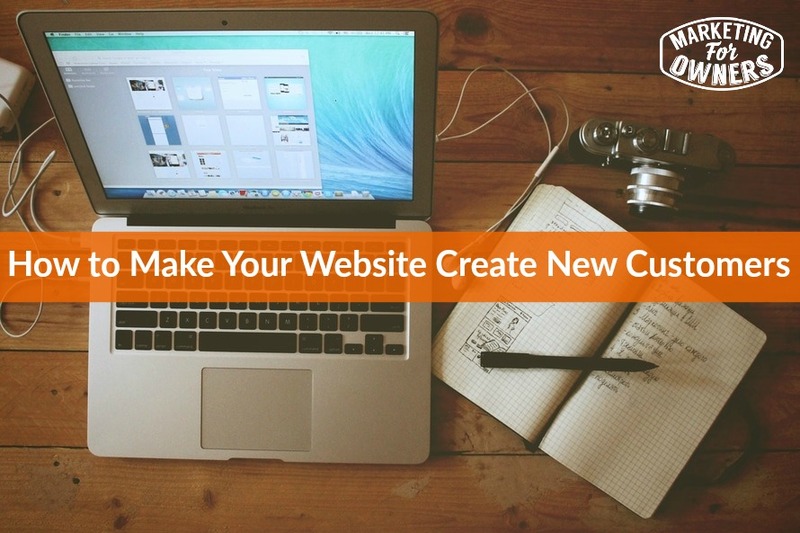 Make sure that when they go to your website, it is going to be able to convert them into a customer. So let me explain. Now if you’re wondering, ‘Wow, well who are you Jon? What do you know about it? Well just before I recorded this, I just quickly worked it out so I can explain it to you better. My businesses create somewhere between 60 to 70 new customers so it doesn’t include repeat customers every single day. And when I mean customers, I mean people who have paid money. And they come purely online. Okay. So I know what I’m talking about, I’ve been doing it for quite a while. Very simply if your website sells things, if it’s like Amazon or like my Fire Protection Online, or something like that, as an e-commerce site and it sells stuff, then there are different ways of getting them there, and they are going to become customers. But if it doesn’t, let’s assume it doesn’t actually sell something online, because you don’t need to. Then generally most people’s websites are purely a brochure. Which means they have an about page, where it tells you about your services, your products, they have a homepage. They say, welcome to our lovely site and it’s pretty, it’s nice. When you went to the web designer, you thought this was the best looking version, you thought it was great. But what do you think they’re going to do? That’s it. What do you think they are going to do once they look at it and finished, what do you think they are going to do? Do you think they are going to find, look for a phone number, which may be clear at the top of the page, and then they are going to phone you up? Or do you think, they are going to go to the contact us page, and they are going to fill in the form, or they are going to find the email address and email you? No. Yes. No. see. You’re not sure. Are you? Well they’re not. Generally people surf around websites in their spare time. Not when they are busy. If they’re busy and they’re surfing on a website, your website, it means what they need is quite urgent. And filling in an email form is not going to help them. They want something right now. They want answers to their problems. The reason they require your product or your services, the things you do and they are looking at it, is because they have a problem, they have a need, and they’re looking to fill it. And they don’t want to mess about. If they wanted to phone up or fill an email form, they’d be using other means. They want quick. So, if it’s in the evening, out of time, in their spare time, they are not going to phone you because they know they are going to get unanswered phone. They don’t think you are going to be there. Because I doubt that you are going to be there. And if you are, you might not have put the hours you are open. If it’s on the weekend, are you there? Are you going to answer the phone? If you are at shop, will you be busy? Do you have time to answer the phone? They’re using the internet because they’re used to it now. They’re accustomed to it. It’s been around for ages. So to make your website get you new customers, you have to know who comes to your website, and you have to capture their information. And it’s very very simple. The website becomes a lead generation tool. And to do that, it needs to be modern. And my modern, it means it needs to be updated. It needs to be current. People want to buy from somebody who gives them information. People want to be interested. They want to read something that looks like it’s current. If it looks like it was written a while ago, they’re not interested. If it’s just a general, we do this. We sell this. They’re not interested. That does not interest them. They want to hear 7 ways to keep, to comply with the accounting regulations, etc. They want for their business, they want to learn 5 top tips to keep their lawn looking bright and green. They want to know things like this. They don’t want to know that you do it, they are not interested. That’s not their problem. You see. Their problem with their lawn, is that it looks a bit scruffy. Now of course you know they need a landscape gardener or a gardening service. But that’s not what they’re looking for. They want to know how it should look good, and they want to find someone who can tell that, someone who is an expert. So the reason they’re reading your thing about 5 top tips, is not because they want to do it themselves, they want a, them might want to choose to do that. But generally if they were going to do it themselves, they’d have done it. Yeah. They are looking for information. They want to know that you know. They don’t want to hear, that it’s just given that you do it good enough. They want to know how it’s done. So that they are employing the right person, it’s going to get the right result that they’re looking for. And with the accounting, we all know we can just go to an accountant. But when you feel better, if you knew that accountant was good, and had the information that’s pertinent to your situation, so you need to be able to do this. And the best way to do this is with something like WordPress, the content management system. You can convert your website to a WordPress website. It costs you pennies. It will cost you less than a $100 to put one together. You can do it yourself. You can operate your own website. WordPress is as simple as using word. It’s been designed, it’s not, it has a word ‘Word’ in it. It’s nothing do with word. But it’s been designed to be what they call idiot proof. Even I can use it. It is designed for those of us that are not website coders to be able to put our own websites together. It is one, over one third of websites on the internet are built on WordPress because the actual platform in the background, it’s free. It’s free. WordPress is kind of like saying Android or Apple for your phones the operating system in the background. It’s dead simple. There are apps, they are plugins, do everything. You can get people on upwork or freelancer or fiverr to copy your information from your current website into a WordPress site. You can even have them set it up for you, if you’re just a little bit scared. But if you look at my www.website101.co course, that shows you how to do it, if you’re not sure. But there’s loads of free information online, on YouTube, how to do it. Everything. But once you do, once you do that, once you have a website, you can then update it, you can then add new products, you can then take photos of the last job you just did. And what it looked like before, and what it looks like afterwards. That’s what people want. That’s how you are going to get customers. That’s how you are going to get leads. Now of course, on another one, we’ll talk about how to capture to leads, how to create lead magnets, something of value, that people will enter their email for. And then you can email them and nurture them as a lead, and convert them into a customer. But just start with that. Please, please have a website that you can update and that gets updated and looks current. When I look for a service, first thing I look at, if it’s out of date, I think they are old fashioned, out of date, not using them. There’s plenty of alternatives in google for me to try. So remember that. Okay. Now it is a Thursday. So a quick drive time podcast for you. Today we are recommending The Suitcase Entrepreneur. This is Natalie Sisson. And that would be of interest to you my friend. 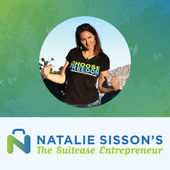 So Natalie Sisson, The Suitcase Entrepreneur. You’ll find it on iTunes, on everything. And she’s got a great website, she has been around for years. Enjoy. Tomorrow we have a fantastic interview with Tom Morkes. You may not know Tom but he is the secret name behind lots of the world’s greatest book launches. Great interview. Well worth a listen.